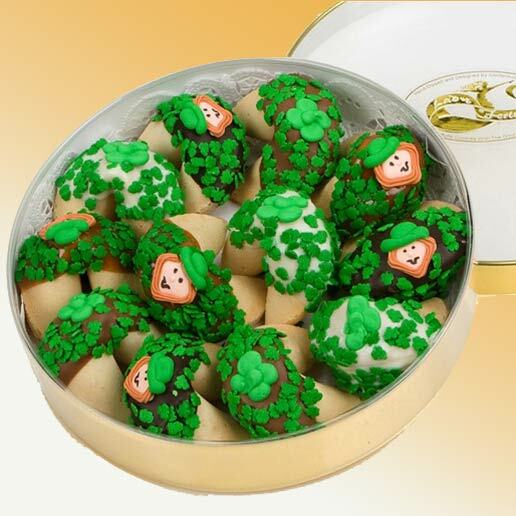 Treat them to a delicious treat and send them some Luck 'o the Irish too! Our lovely Gold Rimmed Acetate Wheel is filled with One Dozen of our exquisitely Hand-Dipped and Decorated St. Patrick's Day Fortune Cookies nestled inside on a White Doily. Inside they'll find our traditional messages of Good Fortune. Our Wheels are heat sealed for maximum freshness and quality!